GASTRONOMY by Joy: Cheers to One-of-a-kind Paire-ing! Considered to be one of the most significant discovery of a self-proclaimed gastronomer. 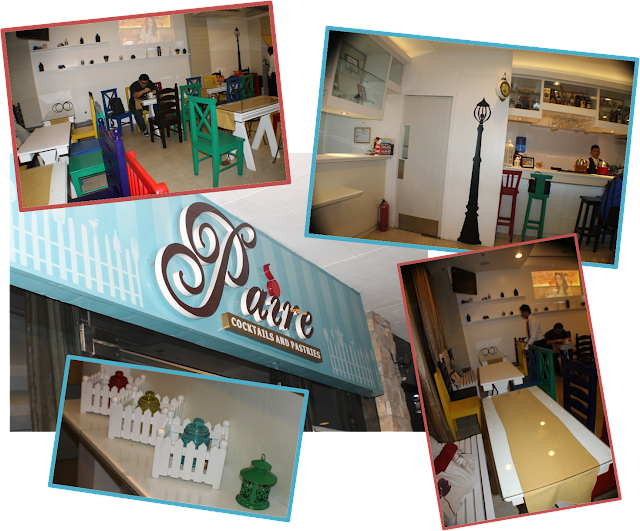 ‘Paire Cocktails and Pastries’ will let you experience a foodie outburst that's definitely one of a kind. They have been serving a new after-meal experience by pairing sweet and savory pastries with a cocktail drink for a year already. Thus, guests (Yay! That included me.) were treated to a parade for the palate. 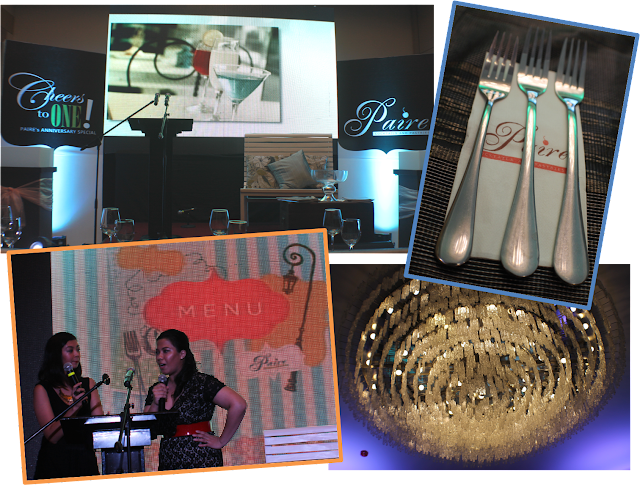 Last November 26 at the function room of Cocoon Hotel, everyone anticipated an event where scrumptious masterpieces were partnered with unforgettable drinks, cited as "Cheers to One, Paire's Anniversary Special." At the event, guests were able to sample the revelry with the help of the wait staff in choreography, each pair was introduced by Kat herself and promenaded across the hall. But before I do present the pairings, let me share first the dinner that had me dreaming of coming back to Paire Cocktails and Pastries. If I heard it right, this was the first time they have had to set out the new addition to their menu. Now, complete meals for breakfast, lunch and dinner are available, together with sandwiches, pairings and pastries samplers and of course mocktails and cocktails. First to be presented on our table, the recipe perfected by the Chef Abby inspired by her Dad's love for Pumpkin Soup and Ceasear Salad. The hearty bowl of pureed and creamed pumpkin won me over, without leaving a saltine mouth. The salad is just so, but what I like in it is that the dressing didn't overpower the freshness of the greens. We then were served with a plate of Fettuccine Carbonara. I love that the fettuccine doesn't have that bitter after-bite. I just need to note that I am the saucy type of pasta eater, thus, a few more of the white sauce might make it to our family's top Carbonara list. Rice-lovers will go gaga over the Beef Salpicao. I understand that the dishes chosen for their revamped menu was so inspired by their family's favorite and held in secrecy, they are heirloom recipes being handed over by the matriarchs of the family. When my plate topped with the Salpicao and rice came, I thought the meat would be dry and being a bit wary of not having some sauce to deal with it. But when it reached my mouth, a burst of garlic infusion on tender pieces of meat. Mind you no need for more sauce here! With that plate is a glass of full-bodied red wine. I thought I had enough meat for the night and it was just filling, till one of the best-selling finger food from Paire came. Ligid as it is called is yet another of their family's secret. It is actually their take on chicharon but without being air puffed from over frying. It has that mild crunch with a tender bite leaving you addicted to it especially if you dip it in their house-made vinegar. And hey, no oil on my fingers! And before we knew it we were being served with a palate -cleanser. The chocolate syrup laden Calamansi sorbet will make you prepared for more. Indeed, the night had just begun to really spruce up some heat, as the parings were then presented in all its glory. Till finally all is well when my first 'paire' was sincerely delivered for y indulgence. And ahh, they were amazingly right, the Class A, by namesake has to be amongst A Class and should be on every gourmand's must-try list. The almond wafer with whipped cream is not meant to be eaten on its own. The drink that best complemented the pastry is non-other than a mix of Amaretto and some tangy fruit juices such as lemon and lime. As I was still savoring the Class A sampler, another pairing landed on my table-space. A savory one this time. On my square plate is the aslice of Spinach and Cheese Tart with a shot of Sparkling Lemon. As we were taught, you get to run the fork on your pastry, dump it in to your mouth and while you are munching on every bit of it, you sip a little of the cocktail and, Tadaah (! ), a gastronomic experience will explode in your mouth. Now, let this be a feast for your eyes. Sorry if I might leave you dreaming of these pictures till it's your time to have the experience, which is what it's doing to me right now as I finish this blog off. The Fruit Basket ala Mode. Fruits on Mudpie and Coffee Crumble Cocktail. 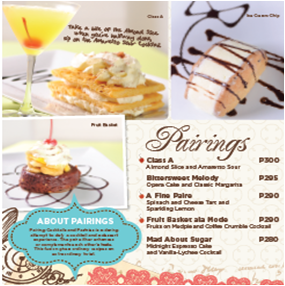 And it's time for Sweet Summer, a match for those who love Filipino snacks such as Leche Flan and Halo-Halo. With it is Creme Caramel and Halo-Halo Cocktail. The Black Forest. Choco Sandwich with spiked Vanilla Filling and Berry Blast Cocktail. Oh yes, I'm a Black Forest kinda girl, and if I were to be a cake that is my choice. This definitely serves to be one of my choice together with the Class A. Any sucker for Chocolate cakes will not be turning s head away to this beauty. The very berry flavor of the cocktail enhances the chocolatey goodness of the mini cake sandwiches. Ice Cream Chip. Chocolate Chip Cookie with Spiked Ice cream and Chocolate Cinnamon Martini. Drop dead gorgeous piece of cake! Refreshing yet not striking in the head, the Amaretto Sour! The Nantes family as they toast with all of the guests hollering "Cheers to One!" Cheers to One from Gastonomy by Joy! More wonderful years of Paire-ings ahead! Address: Gr. Floor Cocoon Hotel, Sct. Tobias cor. Sct Rallos, Q.C.